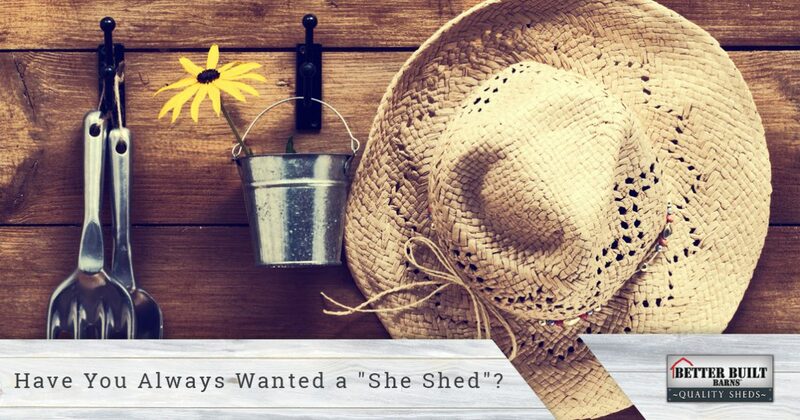 Have You Always Wanted a “She Shed”? Everyone has heard of the “man cave,” and this specific space in a house can range from anything to a small billiards room to a massive home theater area. The man in the house often decorates his “cave” with sports memorabilia, movie posters, and other items that he’s interested in, and he most likely spends a majority of his time in that room. While there’s nothing inherently wrong with that, why should the men get to have all the fun? A woman wants to create her own unique space as well, and while there may be plenty of rooms in the house that she could turn into her own “woman cave,” she might want something else, something different. At Better Built Barns in Oregon, we’ve helped many women create the perfect “she shed” where they can enjoy their own activities. Statistics may be changing somewhat, but more women stay home with the kids than men do, and once dad comes home and takes over watching the little ones, mom way want to retreat to a quiet spot where she can unwind. If you enjoy yoga, a backyard shed that has space for exercise can be the perfect spot for an hour of peace and solitude. The shed can be wired for power and HVAC, so if you have a favorite yoga DVD or YouTube video that you like to use, you can have everything you need for a successful session. You can even have your own hot yoga room! 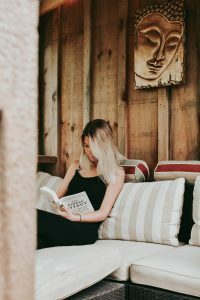 If your spouse or partner has taken over the TV room in the house and there isn’t really a quiet place to read your favorite books, a she shed can be a great alternative. The weather in Oregon doesn’t always allow for reading outside. By decorating your shed with your favorite things and putting your most comfortable chair in the room, you can have a nice, quiet reading spot that you can escape to whenever you want. You can add a small refrigerator where you can keep snacks and beverages, and you can create your very own paradise! When girlfriends and neighbors drop by for a cup of coffee (or wine, depending on the time of day), you may not want to settle for simply sitting at the kitchen island. Perhaps you’ve both had long days at work, and unwinding in a chic cottage where you can converse without being interrupted can be the best remedy. A comfy couch or chairs and a coffee table can create the ultimate conversation spot where you can relax with your best friend or by yourself. If you’re a woman who wants to design a space that’s all your own, and you love the idea of an outdoor shed that you can transform however you see fit, contact Better Built Barns today. You can choose from any of our models and customize them with the features you truly want.